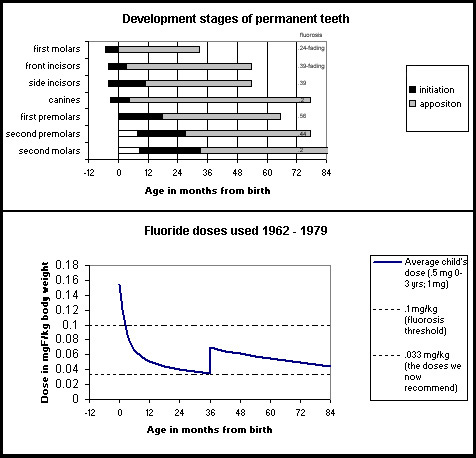 The general idea here is to look at what the teeth are doing (top graph) as the fluoride is taken (bottom graph). Then look at how severe the fluorosis is (the little numbers added to along the right side of the top graph). Let's use the top tooth as an example. At birth (zero on the age scale) the first molar is starting the stage called apposition (the lighter part of the bar). And way off to the right you can see the fluorosis score, ".24 fading". The higher this score, the more fluorosis there was on that tooth type. Note that the bottom graph is lined up, time wise, with the top graph. Now, scanning all the effects on all the tooth types, I can draw a generality. What it says to me is that the most sensitive stage of tooth development is probably the "initiation" stage. Here is how I come up with this. Here is a brief summary of the stages of tooth growth. The initiation stage is the beginning of the growth of a tooth. For our purposes we can think of initiation as beginning a cellular stage of growth, when cells form the outline of the eventual shape of the tooth. The next stage of growth is apposition. This is the "matrix" stage, when the cells above start secreting matrix, which is sort of like cartilage. The matrix makes a complete tooth. In the next stage, calcification (not shown on the graph), the matrix tooth is mostly dissolved and replaced by calcium and phosphorus, which makes the tooth more bone like. It does appear that the time near birth, when the main "smile teeth" are in the critical initiation stage, is the main time to be concerned with fluoride overdoses.